A recent announcement from BBC of 17 new pyramids discovered in Egypt arouses the interest on the archaeology aided by satellites imagery . The idea is that of observing the archaeological sites from above, to have a better view of the landscape. In some cases, the survey of a region ends with the discovery of new archaeological sites or with the precise location of an ancient lost town. These archaeological surveys are usually performed by means of airplanes, but satellites give different opportunities and in the case of Goggle Maps, a free opportunity too. BBC announced that the University of Alabama used some data from NASA infrared equipped satellites to survey the archaeological sites in Egypt. According to a researcher of this University, Sarah Parcak, it is possible to see the ancient structures under the sand. Waiting for a scientific report on the subject with details on the method, we can tell that the infrared inspection is based on collecting the radiances in various wavelength bands, in the infrared range of the electromagnetic spectrum. The resulting profiles depend on the methods used to obtain the surface data from radiances. To have a good detection, the surface must be free from clouds. The Egypt’s Minister of State for Antiquities Affairs, Zahi Hawass, seems to be quite interested to the new technologies, but, as he told Ahram Online, the satellite infrared images are only able to locate the remains beneath the sand . It is then necessary, according to Hawass, to identify them with archaeological researches on the spot. From the news on the Web it is not clear how many sites have been analyzed by the team of the University of Alabama. It seems to be a huge number. Besides the analysis with infrared imagery, let us consider that there are other remote sensing techniques that can be useful in archaeology: among them we have the LIDAR system, which is, as we discussed in , able to see under the canopy of the forests, and the SIR-C/X-SAR imaging radar system, which has waves that can penetrate the clouds, and, under certain conditions, vegetation, ice and dry sand . Of course, these facilities are not freely available and needs financial supports. We could then ask ourselves if a free satellite service, such as Google Maps, can help in some archaeological researches in Egypt. It is my opinion that the answer is positive. In studying the Merowe Dam and the paleochannels of the Nile we compared the images from SIR-C/X-SAR imaging radar system, with those of the Google Maps . After a suitable image processing with some freely downloadable programs (GIMP, IRIS, AstroFracTool), the Google Maps revealed astonishing details of the network of old buried channels of Nile in the Nubian region. The same for the “raised fields” near the Titicaca Lake in Peru: the processing of Google Maps revealed the network of these ancient earthworks and canals. Let us then try to apply the image processing to the Google Maps of those areas in Egypt, where according to the press, the infrared satellite imagery is giving good results. We see that one of these investigated areas is that of Tanis, a town of the ancient Egypt. In Fig.1, it is shown what we can have after processing the image from Google Maps. This image seems to contain quite clear information on the buried town too. Another example is the site where there is a buried pyramid, according to the researchers of the University of Alabama . 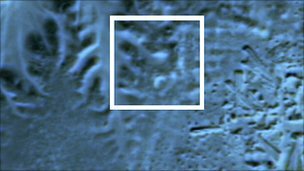 The site is at Saqqara: Figure 2 shows two images, differently processed, of the Google Maps. The reader is invited to compare these images with those published on the Web, copyrighted BBC. I guess that after comparison, the reader can draw some positive conclusions about the Google Maps and its use for an archaeological survey of Egypt. As Zahi Hawass is telling, it is necessary to understand whether some “anomalies” revealed by the satellite remote sensing are archaeological remains or not. This means that archaeology can only receive benefits for geophysics researches and the related use of remote sensing. 3. Lines under the forest, A.C. Sparavigna, , and http://arxiv.org/abs/1105.5277. 4. SIR-C X-SAR Earth-Imaging Radar for NASA’s Mission to Planet Earth, Infopage. An infra-red satellite image shows a buried pyramid, located in the centre of the highlight box. This is the Saqqara area where there is a buried pyramid. The two images have been obtained after processing in two different ways the Google image. According to Ref., the pyramid is in the marked area.